Welcome to our villa in the prestigious and gated community of Highgate Park where (if you allow them!) DREAMS DO COME TRUE as you will find when you relax in our luxury well equipped home. We only purchased the property this year after having taken villa holidays in the area for the past 20 years and stayed in many of the vacation communities. We have enjoyed ourselves in many of the communities but really find the tranquillity of Highgate Park a real pleasure after a full day in one of Orlando’s many exciting venues. When entering though the gates of Highgate Park you will appreciate the feeling of security with the mixture of residential and holiday homes. 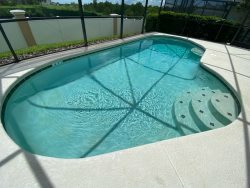 Our home is located on the edge of the small development with a larger than normal south facing pool deck to enjoy the Florida sun from early in the morning to late in the evening. Highgate Park is located off highway 27 and a stone throw from highway 192 which is the main route through to Disney and also boasts an abundance of good restaurants. The main supermarkets of Publix and Walmart are less than 5 minutes from the gates and provide all the additional needs for a relaxing stay. The villa itself holds an imposing position at the bottom of the estate and is of two storey construction and offers everything required for a family of 8 with comfort. Unlike a lot of villas ours backs onto a conservation area and so you are not faced with another villa looking directly at you which is a real bonus when wanting to relax with the family. You enter through the double doors to a large entrance hall with the twisting staircase to the first floor and the bedrooms. An alarm is fitted to the house which, for your peace of mind is monitored directly to the police. Large glass top table with formal dining for 6 on comfortable chairs. The dining room leads through an arch to the large nook and kitchen area. A very light and pleasant area for the more informal dining and breakfast times. There is a table with 4 chairs and has dual aspect windows to the side of the house and pool area. Very large deck with ample poolside furniture to make it a perfect place to soak up the sun and being south facing the sun is there all day. Shade is provided by the covered lanai where a table and chairs provide outside dining opportunities. Both the pool and spa can be heated on request. An outside shower is also provided. The double garage has been tastefully converted into the games room and has table football, Air hockey and pool table. The floor has been fully tiled with colourful and soft tiles to ensure a comfortable experience. King sized bed with side tables and ample drawer space. A 32” flat screen TV completes the main room leading though to two walk in his/her wardrobes. One wardrobe contains a safe for those precious bits and pieces that you may wish to leave at home. The bathroom consists of a large corner bath, large shower, separate his/her sinks and a separate toilet. King size bed with ample drawer and wardrobe space. There is a ceiling fan and TV. En-suite with shower, sink and toilet completes the second master suite. Two single beds with large wardrobe and ample drawer space complement this “kids” room which has Disney features and also a “Mickey” designed TV! Two single beds in a beautifully finished “fishing” themed room with nets on the wall and a TV and DVD player to keep young minds busy. There is a fully equipped laundry room on the second floor with washing machine, tumble dryer and ironing board and iron. In summary we hope to have provided you with a home from home feeling and if like us you will settle in immediately and the only negative will be going home and leaving the Florida sunshine and hospitality. If you are visiting to play golf then the championship course of Highlands reserve is only 1 mile south on highway 27. If you choose to rent our villa then we wish you a wonderful and peaceful time during your stay and if you have any questions then please address them to Homes of America in the first instance and we will be happy to help where we can to make it a special holiday.